Scarlet Benoit’s grandmother has gone missing and the police have called off their search. But Scarlet doesn’t believe that her grandmother ran away–she thinks that something terrible has happened to her, and she intends to find out what it is. When Scarlet meets Wolf, a street fighter who seems to know something about her grandmother’s disappearance, she finds herself drawn to him even though she doesn’t trust him. She embarks on a journey to rescue her grandmother with Wolf’s help and on the way encounters Cinder, who has just escaped prison. Scarlet realizes that there is a lot more involved in her grandmother’s disappearance than she thought. I loved this book! I really enjoyed the first book, Cinder, because it was such a different type of book than I had read before. Even though I enjoy science fiction, a sci-fi fairy tale retelling seemed a little bit strange to me. I’m so glad I gave it a chance though because it is such a fantastic and original story, and the sequel, Scarlet, was even better! Scarlet is such a fantastic character! I love a strong female protagonist and Scarlet fills that role perfectly. She not only runs her grandmother’s farm, but she knows how to defend herself and is determined to rescue her grandmother no matter what. She initially doesn’t trust Wolf, especially once she realizes he knows more about her grandmother than she thought, but she and Wolf have an undeniable chemistry that keeps drawing them together. It was also really interesting to see how Scarlet’s story intersected with Cinder’s. The book shifts back and forth between the two narratives and while I initially guessed at how Scarlet and Cinder’s stories related to each other I didn’t expect the twists at the end! The only complaint I would have is that I missed Kai–he’s not in as much of the book as I would’ve liked but I’m guessing he’ll play a bigger role in the next one. I did enjoy the little bit we did see of him in Scarlet because he was dealing with the aftermath of Cinder’s appearance at the ball and was conflicted between his feelings for her and his desire to do what is best for his people. Overall, Scarlet was an amazing sequel with crazy twists! It was even better than Cinder in my opinion and I’m very excited to see what happens in book three! 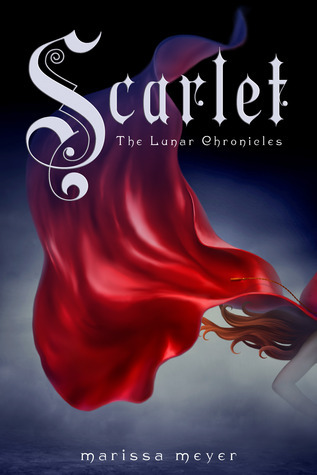 Scarlet was released February 5, 2013 and is the second book in the Lunar Chronicles. The third book, Cress, is set to be released in 2014.